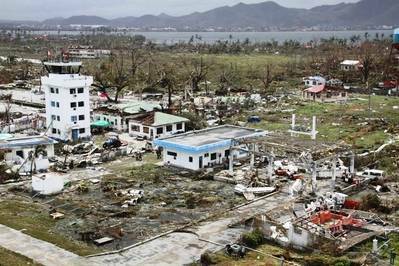 At least 10,000 people are feared dead after Typhoon Haiyan bombarded the Philippines last Friday, November 8, with death toll figures expected to continue rising. The storm, recorded as one of the most powerful in history to hit land, produced wind gusts of more than 200 miles per hour, 15-meter waves and seven-meter storm surges, and has destroyed roughly 70-80% of structures in its path, according to estimations by the United Nations. Philippines president Benigno "Noynoy" Aquino III has declared the nation in a state of national calamity. Transportation and communication remain down across much of the affected area, and several ports are still closed, leaving many vessels nonoperational. The U.N. said more than 660,000 people have been displaced by the storm, some without access to food, water and medicine. Some companies within the shipping industry have already pledged support to the devastated country. Mitsui O.S.K. Lines, Ltd. (MOL) announced a $30,000 (USD) donation to aid relief efforts in the nation noted for its strong maritime ties. Many Filipino seafarers serve aboard MOL vessels, and the group has a training facility located there. A total of nine maritime incidents were recorded overnight November 8 during the onslaught of the typhoon in the central part of the Philippines. The typhoon caused nine vessels in the Visayas region to capsize, submerge, drift and run aground. M/V Schelde Trader that was dragged by rough seas to the vicinity waters of Lauis Ledge in Talisay City. No casualties reported by CGSS Aduana. MV Cagayan Bay and MV Osamis Bay, both owned by Gothong Shipping lines, were detached from mooring lines at the bollard of Gothong Wharf docking area in Mandaue City. No casualties reported and the vessels were about to be towed back to port if weather permits. Barge Big Champ, owned by Asian Shipping Corp, ran aground at the vicinity waters of Fishport, Poblacion Guindulman in Bohol. CGSS Jagna, the local police, Jagna Emergency Rescue Unit and TARSIER 117 rescued all of its eight crew members. Barge Roger, owned by Asian Shipping Corp, ran aground at the same vicinity as Barge Big Champ. CGSS Jagna, the local police, Jagna Emergency Rescue Unit and TARSIER 117 have also rescued all of its eight crew members. One crew is still missing. Barge Castor 6, owned and operated by Concrete Solution Inc., drifted and ran aground at the Marine Protected Area of Canduman, Mandaue City in Cebu. CGS Tagbilaran and SOG personnel were immediately deployed and rescued all crew of the said barge. MV Rene, owned by Fortune Sea Carrier Inc., accidentally ran aground at the sandy portion of Bonbon Cove in CPG Bohol. CGSS Ubay immediately rendered assistance in the towing of said vessel and advised the master to file a marine protest. As this develops, M/Tug Metro Tug II, owned and operated by Cebu Harbor Pilot, took shelter against the storm but unfortunately capsized due to strong waves at the vicinity waters of Santiago Shipyard in Barangay Tayud, Consolacion, Cebu. The vessel has already returned to its upright position with no injured or casualties reported. MV Super Shuttle Ferry 17 submerged at the vicinity waters of Pier 8, NRA, Mandaue City due to heavy waves. The said vessel was reportedly carrying 8,000 liters of diesel fuel and 200 liters of oil. The incident was already reported to the Marine Environmental Protection Unit-Central Visayas for further action.